On Saturday, the Alderleaf Wildlife Tracking Apprenticeship did a day-long outing to San Juan Island, a unique piece of land in the rain shadow of the Olympic peninsula. This island, once contented over by both the American and British government is home to some unique wildlife. Both European rabbits (Oryctolagus cuniculus) and European red foxes (Vulpes vulpes) where brought to the island to provide sport and food. 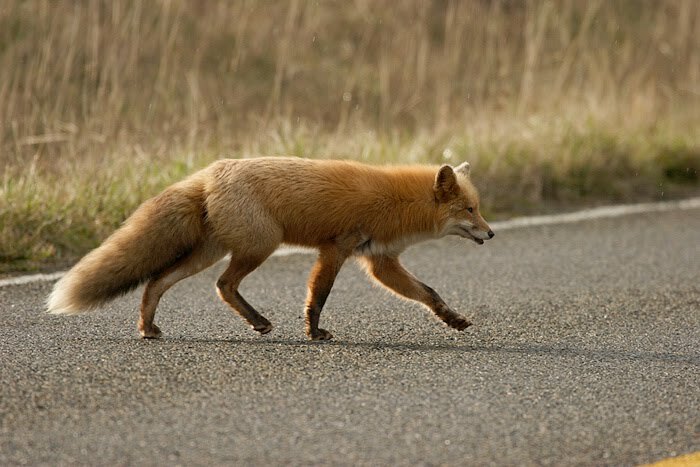 Though European red foxes were introduced throughout the valleys of the west coast of the USA, the only place European rabbits can be found in the USA is on San Juan Island, in WA state. Unlike the native Brush rabbits or Mountain cottontails that live in WA state, European rabbits dig burrows and live colonially. 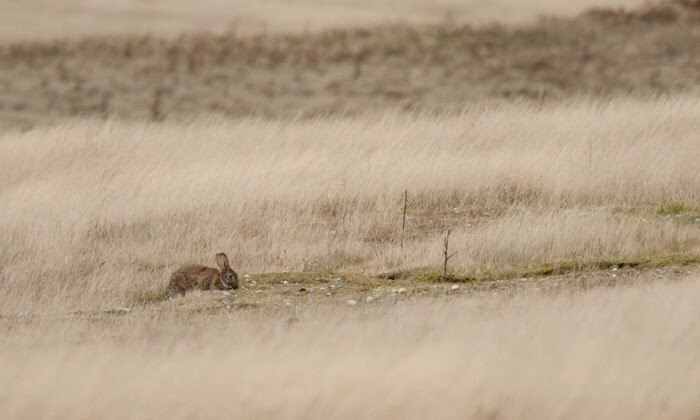 The rabbits are not native to the island, but they do provide food for foxes and eagles. While tracking recent rabbit activity in a warren, Michelle spotted a silver phase red fox pop out of one of the holes. For a moment they both looked at each other, then the fox ran off over the hill and we ended up trailing it through the dunes. The foxes trail led us through the prairie and we ended up finding some older fox sign in the process. 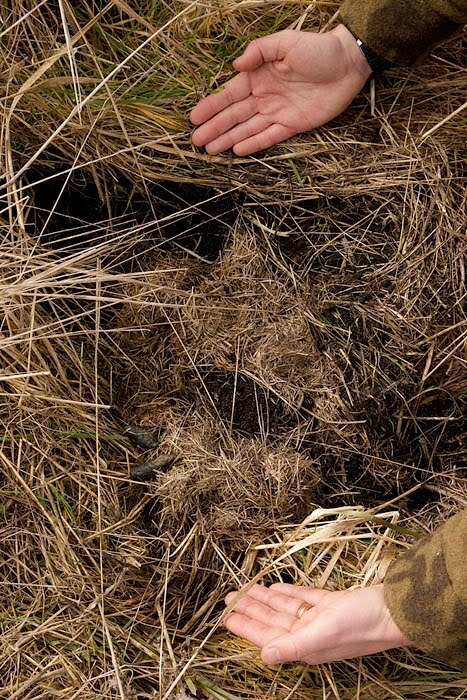 One of the signs we found from the foxes were these vole nests that had been dug up. 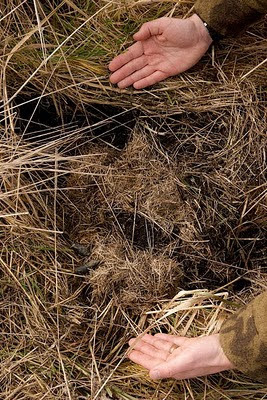 In the native prairie throughout the American Camp area, you can observe countless vole runs that ran in many directions under the cover of the grasses. After exploring the prairie, we checked out the forested area on the hill above. Here we came across some feathers from a recently consumed varied thrush. The forest is home to a variety of birds, including several woodpecker species. 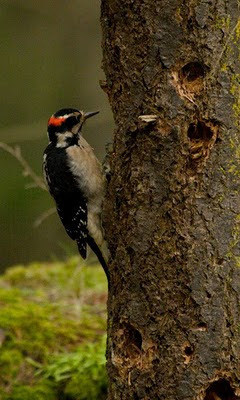 This male hairy woodpecker allowed us to observe its foraging activities from up close. We got to see the freshly made holes where the woodpecker had excavated and consumed some beetle grubs. 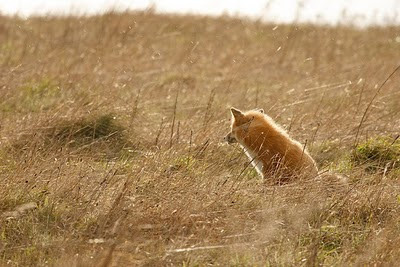 Towards the end of our day, we spotted another fox sitting and soaking up the early springtime sunshine. This fox did not run when it saw us, and allowed us to observe its hunting efforts through the grasses and shrubs of the prairie edge. Here the same fox can be seen flying through air as it pounces as a hidden rodent in the grass. 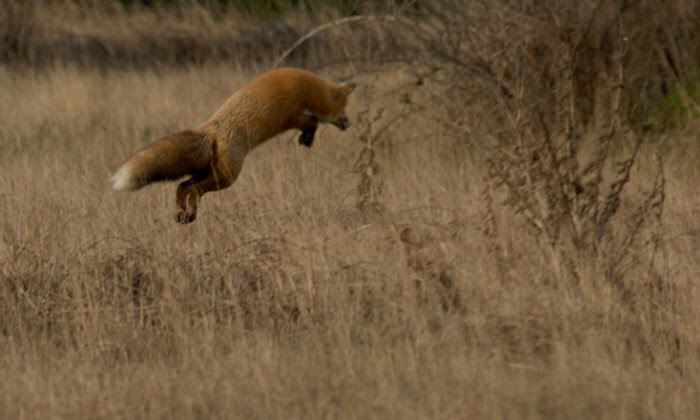 It showed amazing agility and skill as it hunted for its hidden prey. We felt incredibly lucky to have observed the intimate details of their lives, both through direct observation and through the track and sign they left behind. The day was a tracker's dream, and we left for home inspired and deeply satisfied! Here Alderleaf Wilderness Certification Program student Danny Roaman prepares to fire his primitive hunting tools: a bow and arrow made in class with Frank Sherwood. The theme of this class day was primitive hunting skills, which included the use of rabbitsticks, atlatls and primitive long bows. 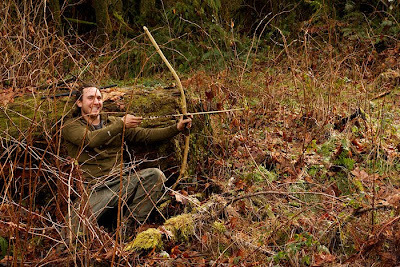 Danny was practicing firing the bow from a partially concealed position at a moving target. 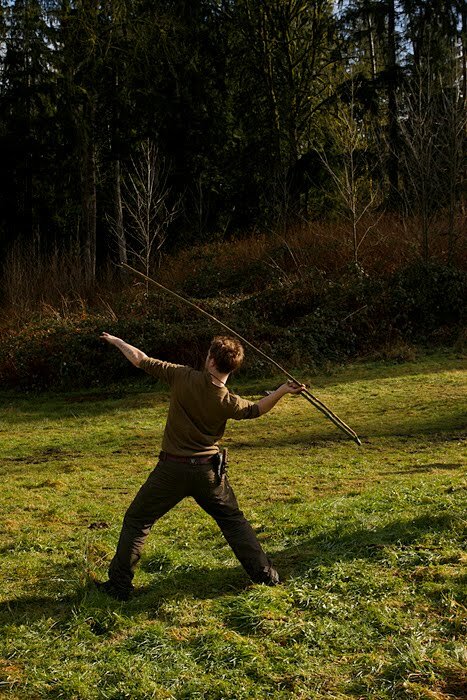 Here, fellow student Alex Steventon demonstrates the use of an atlatl. This primitive hunting tool was used for hunting everything from deer to mastodons! It is composed of 2 main parts: a throwing dart or arrow and the dart thrower. One another class day students took a trip to the amazing wildlife park known as Northwest Trek. This location houses only wildlife native to the greater Northwest region. This location provides a unique opportunity for students to closely observe some of the more elusive animals native to the Pacific Northwest, such as bears, cougars and wolves. Through the process of observation, students learned more about how these animals behaved and, therefore, what kind of tracks they left under what circumstances. This opportunity allows the students to grow as both naturalists and wildlife trackers. 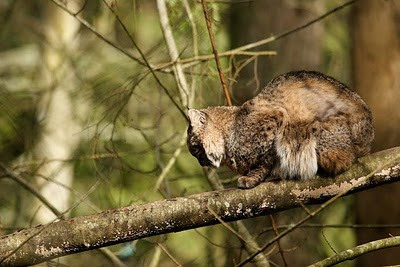 Here, a bobcat perches on a fallen tree soaking up the late winter sun. Such relaxed behaviors are very difficult to observe in the wild.